So through various posts there has been a smattering of information that honestly should be stitched together so it’s more easily found. First up is this number which reiterates what many of us in the pro-rights community already knew. Like Linoge I feel the sample size is a bit on the smaller side but there are a couple of reasons for that. First he made sure to only include data points that are relevant and applicable. Second though is better explained by this piece from Chicago Magazine. It causes an extra realization that validation needs to be performed on the actual numbers as appearances can be deceiving. The media blasts about any and every incident because it does well for their ratings as well as a decrease in frequency makes them more news worthy. (You watch the news not to know what is constant, but what has happened that is unexpected.) Reporting on a decrease in the frequency doesn’t bring ratings or viewership. Further someone has examined the odds of dying in a mass shooting. Unsurprisingly they aren’t high. Here are the conclusions but I suggest reading the whole thing, it’s definitely worth it. We should always strive to continue to reduce all risks of death, especially the preventable risks of other humans, wherever possible. But the risks will always exist. 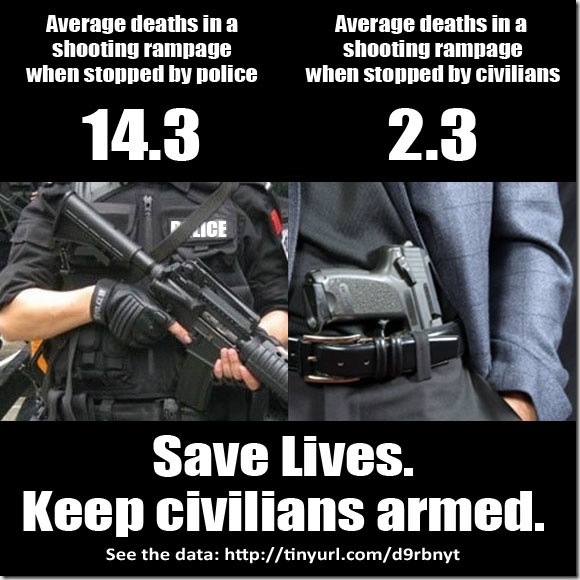 If your chance of dying in a mass shooting is 0.000003% and your chance of dying in a car accident is 0.9%, with a whole lot of other risks in between, I think it’s reasonable to ask if there aren’t a lot of easier and more effective ways to try to use the government’s limited resources to save lives than trying even harder to prevent the next shooting tragedy than we already are. The odds aren’t quite as low as say being struck by lightning within a year, except that his numbers are for lifetime odds. In which case your lifetime odds of being struck by lightning is 1/10000 or 0.01%. So why is it that mass shootings appear to be such a common occurrence? The answer is simply visibility. The media made terrorist attacks look unbelievably common despite the fact that again lightning is a bigger threat to your personal well being. The media can scream so loud and for so long on the same topic that it often seems like the problem is worse than it actually is. There are those of us who will take our time, do our research, and find the facts on a topic before moving forward. Our opponents on the other hand want the media to scream and yell. The more the media makes this look like a common occurrence, because it makes them look relevant. The facts are in though. Our opponents are irrelevant and those facts are becoming obvious to all the adults in the room. The adults in the room are having a conversation and we all wish the children throwing the tantrum would shut up so the adults can continue speaking. It’s not worth spending time worrying about a statistically unlikely event. Is life, is not safe. I know that, most everyone knows that. Frankly I’d rather go out, live and enjoy my life without some nanny trying to control my every action. Even if they do, I could still be struck by lightning, is congress going to ban lightning? Tagged PSH, Safety, Security, War on Nouns. Bookmark the permalink. Crime is down? Or is crime down because PD’s like NYC and Chicago are encouraging people to downgrade the severity of crime reported, not file charges or ignoring them altogether? The FBI doesn’t even accept Chicago’s bullcrap crime reports, they are that messed up. I seem to recall mass killings occurred prior to Whitman in the ’60s, just the media found out that that killing sells papers. Plus they had an agenda to push, leading up to the 1968 GCA. It is an excellent question. However given the overall trends outside of crap holes such as Chicago or NYC all universally point down I would say that is accurate. Chicago, NYC, and others that are ignored by the FBI because as you said they’re messed up. The FBI wants apples and apples, even then often when something has changed in the records put in the UCR you will find they have notes that state “this is not comparable to previous years for the following reasons.” Often those changes result in a higher reporting rate instead of a lower reporting rate. Even then it still trends down. Really, my complaints about the dataset size are exclusively because I want more data. It is entirely likely that there are not any more crimes out there that would fit into the dataset well, and objectively that is definitely a good thing, but more information will always serve to solid-up those numbers. ‘Course, if we could settle on a confidence interval and a few other details, we could generate up what we would really need out of the dataset, but given that the population you are trying to represent is 300,000,000 souls, 30 is definitely not going to cut it ;). I found myself fighting the “I want more data points” line considerably. But that last point is what really drives it home. Overall this is peanuts in the grand scheme.